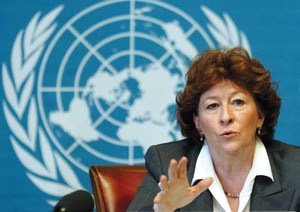 The smearing of Louise Arbour, the former UN Commissioner of Human Rights, continues. This time it's CanWest, shilling for UN Watch, "a non-governmental organization based in Geneva whose mandate is to monitor the performance of the United Nations by the yardstick of its own Charter. UN Watch...is affiliated with the American Jewish Committee (AJC)." The connection with the AJC isn't thought to be worthy of mention by the folks at CanWest. But in its own words, it is "a leading international think tank and advocacy organization that uses education and diplomacy to build support for Israel." It's just released a report highly critical of Arbour. CanWest, a major Canadian news outfit that has routinely censored and even fired staff suspected of being too pro-Palestinian, and has re-written copy to be more favourable to Israel, is all over it. "Arbour's record as rights boss at UN comes under fire" screams the hed. So, having established the provenance of said "fire," let's check out the materiel, shall we? Out of 79 official criticisms of  countries that Arbour issued during this period [2007-2008], only 10 were dedicated to condemning free democracies. The record shows that she was a determined advocate for the adoption of international human rights standards and that she spoke out for many victims around the world. This frames what is to come as an objective, dispassionate critique. It is anything but. To start with, it is important to note that the report covers a small part of Arbour's time at the UN: last year and the first few months of this year. But she was UN High Commissioner of Human Rights from 2004 until this past June 30. The report, therefore, suffers from a certain selectivity. For example, during the relatively short period under review, she didn't criticize Russia even once, state the authors. But as they later admit, she did speak out forcefully against human rights violations by the Russian government on a number of earlier occasions. During this recent few months of her 4-year UN career, we are told that Arbour "held back" from criticizing countries that were influential at the UN, like China, Russia (as noted) and Egypt. Only one statement was forthcoming on Angola, Chad, and Kazakhstan. The report's Table 1 sets out all of the countries critiqued by Arbour during the review period. This is summarized by the Ottawa Citizen--and falsely attributed to Human Rights Watch. And for some reason Zimbabwe is left out, not by Arbour, who slammed that country's government four times, but by the journalist. I'm sure this was inadvertent. Worse, say the authors, "Arbour published no statements at all for billions of victims residing in 153 countries," giving brutal rulers "effective impunity." OMG, all those countries? But then we discover that 82 of them are listed as "free" in the report's Table 2. They include such hell-holes as Vanuatu, San Marino, Ireland and Denmark. Arbour, the authors concede, did speak out strongly about human rights abuses in Sudan and Burma. She spoke out against Iran, too, but she failed to mention President Ahmadinejad’s "anti-Semitic campaign of Holocaust denial and incitement to genocide." "[C]ampaign of Holocaust denial" refers to one stupid conference in Teheran in which at least one of the participants denounced Holocaust-deniers from the podium as "lunatics." "Incitement to genocide" is a reference to the debunked "wipe Israel off the map" controversy. Perhaps this report is not as objective as it represents itself to be? Despite this glaring dereliction of duty--including not censuring the leader of a country for saying something he didn't actually say--Arbour had the nerve to critique various instances of anti-Muslim expression, such as the hate film Fitna, produced and circulated by far-right Dutch extremist Geert Wilders. The authors claim that such interventions encourage the curbing of free speech, although Arbour explicitly condemned moves in that direction by some Muslim member states. The authors clearly want things both ways. I must admit that, reading this report, I am beginning to have a bit of sympathy for the folks over at The Torch like Damian Brooks who complain to some critics (including me, on occasion) that we can't solve every wrong in the world, so that whatever good we are doing in Afghanistan isn't lessened by, for example, not intervening in Darfur. We should, in other words, discuss the Afghanistan case on its own merits. The "what about" gambit is overused, it is true, by commentators right across the political spectrum. But it's overused to the point of abuse by the authors of this report. Arbour did cut a wide swath during the period under review. Her strong condemnation of Zimbabwe's Robert Mugabe, for example, is surely not diminished by her failing to condemn--publicly, at least--North Korea, Oman and Jordan, not to mention Norway, Costa Rica and France, also included in the list of 153. Arbour herself has acknowledged, the authors note, that she took a softer approach with nations such as China and Russia, saying that she chose a strategy of private engagement “that is likely to yield some positive results” over one that “would make me and a lot of others feel good.” I see no reason to doubt her pragmatism, having to work as she has done with the members of the UN Human Rights Council, 74% of whom (according to the report's Table 4) have voted to restrict the activities of--why, the UN High Commissioner of Human Rights. But the authors ride the "what-about" horse at a furious gallop nevertheless. Arbour spoke out against the kangaroo-style nature of post-Saddam tribunals that were meting out the death penalty in Iraq. But why, moan the authors, did she have nothing to say about the rest of the 1,591 executions that took place that year around the world? She criticized Israel four times, but what about all those Arab countries? And sure, she roundly criticized Iran for its human rights record, but what about anti-Semitism, which, as we all should know, is the Worst Bigotry In The World, if I might paraphrase Keith Olbermann. The authors of the report indulge in continual innuendo, and the use of emotive language is prevalent. Arbour's strong criticisms of the Iraq and Afghanistan governments are interpreted as attacks on the United States (see Table 3), which is rather telling, I think. Her forceful comments "alleging" war crimes in Fallujah are implicitly criticized. ("Alleging," eh?) She is "disdainful" and "condescending," but US Ambassador to the UN John Bolton delivers more manly "stinging rebuke[s]." Arbour filed an amicus curiae brief to the US Supreme Court with respect to Guantanamo: the authors suggest that she might have antagonized some of the Supreme Court justices by so doing. (We are implicitly asked to believe that Antonin Scalia might have voted with the majority in Boumediene v. Bush if she hadn't opened her yap, an implication that stretches credulity to the breaking-point.) And as for Guantanamo, what about Tibet? "Arbour’s submission of a detailed, 44-page legal brief, in comparison to a 5-sentence press release over the killings in Tibet, constituted an extraordinary intervention." Perhaps when the case against China gets to China's independent Supreme Court, Arbour's successor will file a similar brief in that venue. Arbour’s position on Israel cannot be compared to that of the Human Rights Council. Indeed, as some of her supporters have noted, Arbour did make certain efforts, anathema to the council majority, to address the actions of all parties. However, on the whole, a review of Arbour’s record shows that her statements were disproportionately weighted against Israel, and that, unlike Kofi Annan and Ban Ki-moon, she failed to confront the council’s self-destructive preoccupation with the Jewish state. These one-sided texts encourage extremists, harm the peace process and ultimately hurt human rights victims on all sides of the conflict. It is to be hoped that incoming High Commissioner Pillay will, on this as on other matters, forcefully counter the worst inclinations of the council, and thereby protect its credibility. To be honest, I don't think the council has much credibility to protect. It is what it is. Its members were not chosen by Arbour, but this was the crowd that she had to work with, three-quarters of which, as noted earlier, had voted in favour of restricting the independence of UN human rights commissioners. Under such circumstances, her public utterances were in many cases nothing short of courageous. In any case, readers should keep a close eye on the way this story is being tracked by the media. Will "UN Watch" be characterized as anything other than a "UN watchdog?" Will its axe continue to be ground out of earshot? Will the confusion with Human Rights Watch continue? Will the pro-Israel media keep baying at Arbour's heels? Stay tuned. This page contains a single entry by Dr. Dawg published on August 4, 2008 1:01 PM. Ramping up the fear! was the previous entry in this blog. Guantanamo: the US finally comes clean is the next entry in this blog.